The World Health Organisation identifies Radon gas as the second risk factor in the occurrence of lung cancer with over 10% of cases linked to excessive Radon exposure. Euro-Gas Management Services Ltd: We are all exposed to radiation from natural and man-made sources. Radon is a colourless, odourless radioactive gas formed by the radioactive decay of the small amounts of uranium that occur naturally in all rocks and soils. Radon in soil is the biggest source of Radon in indoor air and presents a greater risk than Radon indrinking water. Properties built in certain areas around the world are more likely to contain high levels of Radon due to the underlying geology and varying amounts of uranium present. When it permeates the ground into open air, Radon is quickly diluted to low concentrations. However, if it rises into a building, it can become trapped and increase to dangerous concentrations. Alpha particles produced by the radioactive decay of inhaled gas cause irreparable damage to lung cells. 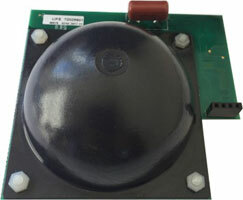 The Euro-Gas Radon SS sensing component detects field range of 0-65,000Bq/m3levels. Witha uniquely designed high performance phototransistor sensor, it has a standard range of 1750pCi/l Rn. Its easy-to-use advanced technology makes it an ideal sensorfor installation into both portable and fixed detection equipment in air quality and gas detection, delivering a complete set of information for instantaneous and average Radon alpha particle concentrations. To find out more, please contact Euro-Gas Management Services Ltd by email at: sales@euro-gasman.com, call +44 (0)1803 844414 or visit www.euro-gasman.com.